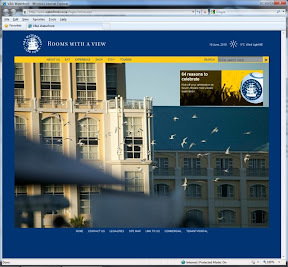 I have always found the V&A Waterfront website to be a bit boring and clunky. It was possible to find the information you needed, but it was not presented optimally and the site itself was uninspiring. I’m pleased to say that there has been a very obvious focus by the V&A on their online presence. Not only have they completely revamped their website, which now actually looks quite attractive, they have also created a special website just for the FIFA World Cup. In addition to that, they have started to increase their social media activities. Having me as the official on-site blogger is an example of their social media initiatives. The V&A website welcomes you with one of a series of great photographs of various elements of the Waterfront. The photo has a menu above which is where you can access all sorts of information about the Waterfront. In the about section there is general information about opening times, maps, history, etc. Then the Waterfront offering is broken into Eat, Shop, Stay and Experience. Eat presents a listing of all the restaurants, with a short description and contact details. Shop is a listing of all the retails stores with contact details. Stay is a listing of the hotels and Experience offers information on all the activities available at the Waterfront from Aquariums to shows to movies and much more. Being able to Facebook ‘Like’ each of the entries is another element of their social media initiatives. The website they have created just for the World Cup is jammed with information about all the special things that the Waterfront is offering over the tournament. You can find information about the various fan zones, activities for kids and much more under the Fan Experience section. The home page has information about the tournament, which teams are playing when, etc. There are details on parking and pedestrian routes, as well as maps and directions. There is also information about Waterfront facilities that have been put in place for the competition, eg the Media Centre and new Visitor Information Centre. Poll change - Where do you watch the World Cup?